Argent an autumnal maple leaf proper inscribed ROYAL MONTREAL REGT in letters Or within a belt Azure edged, buckled and inscribed HONI SOIT QUI MAL Y PENSE in letters Or ensigned by the Royal Crown proper and set above a scroll Azure edged and inscribed CANADA in letters Or. The maple leaf and scroll bearing the word “CANADA” represent service to Canada, and the Crown, service to the Sovereign. The belt, with motto, is the insignia of the Most Noble Order of the Garter. “ROYAL MONTREAL REGT” is a form of the regimental title and “HONI SOIT QUI MAL Y PENSE” is the motto of the Regiment. The 14th Battalion, which was authorized on 1 September 1914 as the ’14th Battalion, CEF’, embarked for Great Britain on 27 and 29 September 1914. It disembarked in France on 15 February 1915, where it fought as part of the 3rd Infantry Brigade, 1st Canadian Division in France and Flanders until the end of the war. The battalion was disbanded on 15 September 1920. The 23rd Battalion, which was authorized on 21 October 1914 as the ’23rd Battalion, CEF’, embarked for Great Britain on 23 February 1915. It was redesignated ’23rd Reserve Battalion, CEF’ on 18 April 1915, to provide reinforcements for the Canadian Corps in the field. The battalion was disbanded on 15 September 1920. The Second World War badge of the Canadian Armoured Corps borne on the regimental Colour and appointments, for service with that arm. 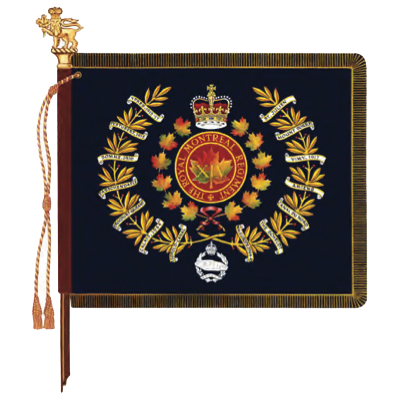 The regiment mobilized the ‘The Royal Montreal Regiment (Machine Gun), CASF’ for active service on 1 September 1939. It was redesignated ’1st Battalion, The Royal Montreal Regiment (Machine Gun), CASF’ on 7 November 1940, and converted to armour and redesignated ’32nd Reconnaissance Regiment (Royal Montreal Regiment), CAC, CASF’ on 25 January 1943. It was converted to infantry and redesignated: ‘First Army Headquarters Defence Company (Royal Montreal Regiment), CASF’ on 12 April 1944; and ‘First Canadian Army Headquarters Defence Battalion (Royal Montreal Regiment), CASF’ on 5 April 1945. This unit embarked for the Great Britain on 7 December 1939. On 28 July 1944, the company landed in France as a unit of First Canadian Army Troops, and it continued to serve in North West Europe until the end of the war. The overseas battalion was disbanded on 30 September 1945. On 24 May 1944, a sub-unit of the regiment, designated ‘No. 9 Defence and Employment Platoon (Royal Montreal Regiment), CIC, CASF’, was mobilized in England. On 27 June 1944, it landed in France as a unit of First Canadian Army Troops, and it continued to serve in North West Europe until the end of the war. The overseas platoon was disbanded on 16 October 1945. On 1 June 1945, a second Active Force component of the regiment was mobilized for service in the Pacific theatre of operations under the designation ’6th Canadian Infantry Division Reconnaissance Troop (The Royal Montreal Regiment), CAC, CASF. It was redesignated the ’6th Canadian Infantry Division Reconnaissance Troop (The Royal Montreal Regiment), RCAC, CASF’ on 2 August 1945. The troop was disbanded on 1 November 1945. YPRES, 1915, ’17; Gravenstafel; St. Julien; FESTUBERT, 1915; MOUNT SORREL; SOMME, 1916; Pozières; Thiepval; Ancre Heights; ARRAS, 1917, ’18; Vimy, 1917; Arleux; Scarpe, 1917, ’18; HILL 70; Passchendaele; AMIENS; Drocourt-Quéant; HINDENBURG LINE; Canal du Nord; PURSUIT TO MONS; FRANCE AND FLANDERS, 1915-18. Calais, 1944; THE SCHELDT; Leopold Canal; NORTH-WEST EUROPE, 1944-1945. Upon redesignation as The Royal Montreal Regiment on 29 March 1920 (see above), it was organized as a two battalion regiment with the 1st Battalion (14th Battalion, CEF) on the Non Permanent Active Militia order of battle and the 2nd Battalion (no CEF designation) on the Reserve order of battle. On 15 June 1920, the battalions were redesignated the 1st (Westmount) Battalion (14th Battalion, CEF), and the 2nd Battalion (23rd Battalion, CEF) (GO 94/20). The reserve unit was disbanded on 14 December 1936 (GO 3/37). The Royal Montreal Regiment was disbanded for the purpose of reorganization on 2 July 1920 and reorganized the same day (GO 138/20). This change was administrative and does not affect the lineage of the regiment.